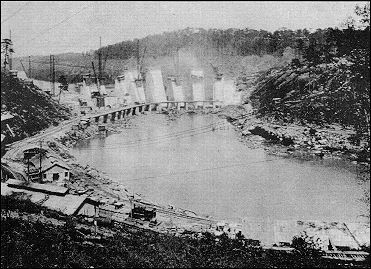 In 1916, the Alabama Power Company obtained the rights to build a dam at Cherokee Bluffs on the Tallapoosa River. Residents of the area were forced to sell their land and move. The area was mostly farmland, dotted by small one-room schoolhouses which generally served families within about a five-mile radius, and small country churches served by traveling preachers who visited each church about once a month. <?xml:namespace prefix = o ns = "urn:schemas-microsoft-com:office:office" />Small country stores were found in some areas. Other areas were served by wagons filled with basic supplies which could be traded to farmers for chickens, eggs and sometimes money. As soon as residents were clear, homes, churches and schools were razed. Family cemeteries were moved, body-by-body. For many residents this proved to be the most upsetting change. Many residents found new homes in Alexander City, Tallassee, Eclectic, and Dadeville. Many former farmers took jobs in the mills after leaving their land because they found the land above the river far more difficult to farm. Miles of good timber were burned to save time in cutting trees. Other trees were tied down to keep them from floating as the water rose. <?xml:namespace prefix = v ns = "urn:schemas-microsoft-com:vml" /><?xml:namespace prefix = w ns = "urn:schemas-microsoft-com:office:word" />Alabama Power Company began building Martin Dam in 1923. Although the majority of the lake is located in Tallapoosa County, the generating plant was built in Elmore County. The cost of the project was $20 million. The gates were closed on June 9, 1926 and the Tallapoosa River began to fill the small creeks and streams lacing the basin. Former residents watched with anguish as homes and fields which had been in their families for generations flooded. Old Indian sites were covered, burying many Native American artifacts under the rush of the water. At that time, Lake Martin was the world's largest artificial body of water. First known as Cherokee Bluffs, the dam was dedicated in 1936 in honor of Thomas Martin, president of Alabama Power Company from 1920 to 1949 and chief executive officer from 1949 to 1963. Martin was instrumental in the development of Alabama Power and a pioneer in the development of the electric system throughout Alabama and the Southeast. In the half-century that followed, Lake Martin has grown in recreational value. Residents of area communities began building small weekend cabins on the lake. Willow Point Country Club with its lake view golf course was completed in 1965. Wind Creek State Park, which was dedicated in 1966, opened its gates to visitors in 1961. Still Waters Resort and Conference Center began development in 1972, when its golf course opened. In the past 20 years, the lands around the lake have undergone a change as development has skyrocketed. 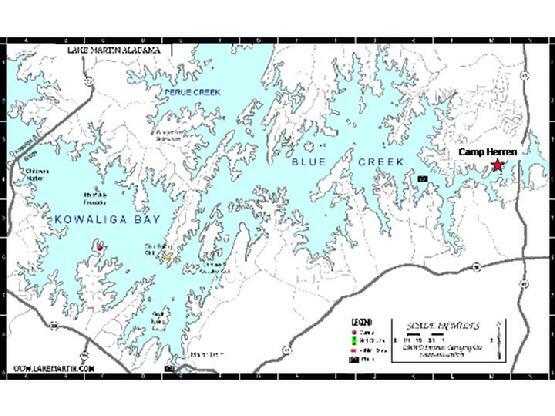 The majority of lots still available around the lake are owned by Alabama Power Company or Russell Lands. Many underdeveloped power company lots are being developed into subdivisions as more and more people choose Lake Martin as a home rather than a weekend getaway.